Ever make a card "just because"? This is one of those times. No challenge, not being submitted for publication, don't even have a recipient in mind. I was digging through my DCWV Mariposa Stack and found this beautiful piece of paper. I trimmed it, mounted it on a card base, threw on some lace and pearls and I was done. I love the lace trims together, and of course, some pearls. ;) I added a birthday sentiment inside. Lovely card, Colleen. Great use of the DP and teh flower pics are gorgeous. Can see why you love that flower so much. Lovely way to let the DP do the work....gorgeous paper makes a gorgeous card! Glad to hear you're feeling a bit better....give those hands a rest! I also love those rare opportunities when you can just create for creatings sake, and your card is lovely! Beautiful and I love the lace trim and of course your pearls! It's great to make a card "just cause" :-) Hope things getting better for you soon! What a beautiful piece of paper, Colleen! It was just crying out for lace and pearls. Beautiful card. Lovely card and get better soon!!! So HAPPY you've had a break from the pain Colleen. Maybe you can try one day on one day off, that might satisfy the addiction~hehe! Such a pretty card, I'll take it as a be-lated birthday! 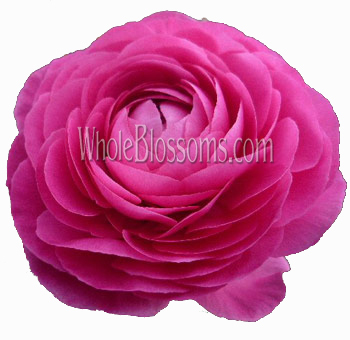 Fabulous photo of the pretty ranunculus. Just because cards are the best one sometimes - you just let the paper or image carry you way. I love the Maraposa stack and you made this paper really come alive. Impressive and beautiful card Colleen - love it!!! Hey Colleen. I love my Mariposa Stack and I love how you used that image! Those lace trims are gorgeous...Would love to know where you found them. Gorgeous card!!! Colleen, this is a beauty!! SO elegant, yet so clean and simple--even if the trims themselves aren't :)! And those ranunculus photos were YUMMY!! So glad that your hands are feeling a bit better after a bit of time off (I can relate!). I hope you continue to see improvement!!! Your mojo is obviously still intact, though!!! OHHHH! Col! This card is simply beautiful! LOVE that lace! Those pearls are the perfect touch! And I hope you get good results back from your xrays-I'm so sorry you are having pain/health issues. I pray that your hands/body would be restored back to normal! What a lovely card. That flower is gorgeous... I have to say I am pretty adicted tto blogging myself. Sometimes it's fun to make a card just because and this one is beautiful. The trims just make it! Yes I've made cards just because too. Sometimes they're my favorite to create because you can be totally spontaneous! :) Your card is so subtle and beautiful . . . love the lace! has to have good skills to know how to use it and you do, no doubt. And I learned a new word today.....so not a gardener - obviously! Beautiful flower (fabulous name) and beautiful card! Your hands are not enabling you to do what you love but you find a fab alternative...You picked the right paper ( I love your choice...) and although you did not use your stamps...it has your signature (elegance!!!) all over it. Gorgeous Colleen! Take good care of yourself; Your health comes first . I am thinking of you a LOT! How elegant! Love the papers and lace. I have these papers too, and can't wait to use them and pair them with those lovely stickers I won from your blog candy. I hope your hands are better. Too much computer gives me a migraine, so I can't sit here too long at a time. This card is a study in simple elegance. I love the taupe shades, so nicely coordinated. Oh, wow! That flower is just gorgeous and so is your card! I'm always attracted to bright, full flowers like that too! 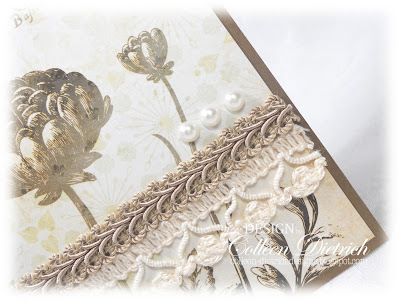 Love the trims you used on your card and the fabulous neutral palette! Beautiful!